Promotional value expires 90 days after purchase. Amount paid never expires. Valid for savory flavours only. $2/bag extra fee to upgrade to sweet flavour. Not valid for tax or gratuity. Not valid for gift cards. Valid only at the Chinook Centre location. Limit 1 per person, may buy 1 additional as gift(s). May be repurchased every 90 days. Limit 1 per visit. Valid only for option purchased. Not valid with other offers or promotions. Merchant is solely responsible to purchasers for the care and quality of the advertised goods and services. Formed by a group of friends in a kitchen, Poko Popcorn went through numerous trials and errors to get the perfect balance of flavors. Made in small batches, this gourmet popcorn in popped using hot air, shaken over a custom-built grater to get rid of un-popped kernels and hulls, and coated with flavors like caramel coconut, salt and vinegar, cheesy dill pickle, and white cheddar. 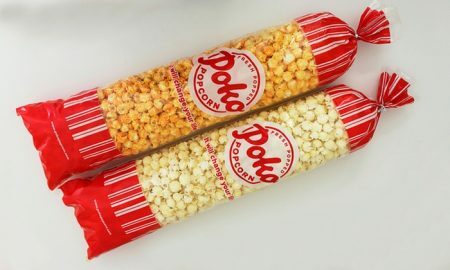 Whatever it is that popcorn-aficionados are looking for, Poko Popcorn has it all.